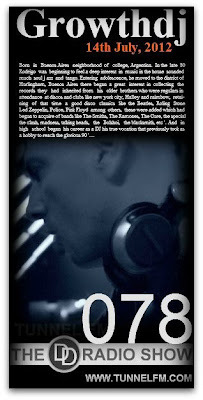 Proudly Presents: "GROWTHDJ" @ Deep & Deeper Radioshow, ePisode 078 // Saturday 14th July, 2012 // Starting at 1am CET, Stay Tuned! INFO: Born in Buenos Aires neighborhood of college, Argentina. In the late 80 'Rodrigo was beginning to feel a deep interest in music in the house sounded much soul jazz and tango. Entering adolescence, he moved to the district of Hurlingham, Buenos Aires there began a great interest in collecting the records they had inherited from his older brothers who were regulars in attendance at discos and clubs like new york city, Halley and raimbow, retaining of that time a good disco classics like the Beatles, Roling Stone, Led Zeppelin, Police, Pink Floyd among others, these were added which had begun to acquire of bands like The Smiths, The Ramones, The Cure, the special, the clash, madness, talking heads, the Bolshoi, the blacksmith, etc '. 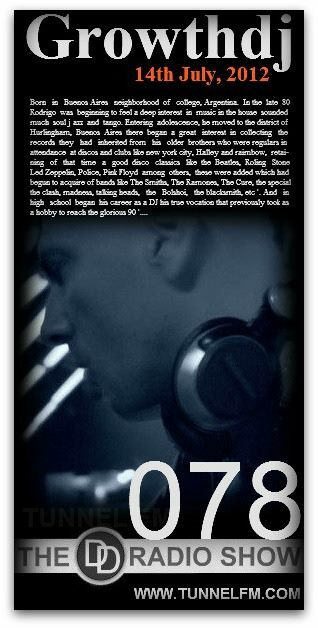 And in high school began his career as a DJ his true vocation that previously took as a hobby to reach the glorious 90 'Here begins a stage where bands were beginning to sound like Depeche Mode, New Order, Bronski beat, Kraftwerk, Front 242, Nitzer Ebb, etc. In the late 90's and different styles are into the house in all its variants influenciándoce in this case, the labels and artists: Plastic City, Twisted log, Yoshitoshi, Alternative Route, records fethis, underwater logs SexOnWax forensic records, absolutely records, records of waste, visitors, fire ants and records of low riders, including all those sounds ringing in his fifth sessions and personalities selected and Western clubs in Buenos Aires gral in 2000, under the pseudonym GROWTHDJ resident called as beautiful Sunday not shared booth with Aldo Aydar Tomy Jacobs, Javier Beltran, Ladoux Lucia and Didier Sinclair, including early 2004 after the tragedy and Cro-Magnon the closure of almost all the clubs and dance halls of the Federal Capital and Greater Buenos Aires comes a proposal to make season in Villa Gesell bar and catering 100% electronic music where he played every day and by the influx of international artists who constantly attended had to improvise a blockbuster after making the hearts of the people who still beating! download their last energies before and after on the beach with the deep house right in the end a couple of seasons decides to go out and see everything through the eyes of the viewer and to the reopening and knowledge of changes in the scene and had to be adapted for a part thereof, from production to showcase their work in social networks that apply to all the influences and experiences to continue their journey, this time as a DJ and producer insist there ..... ..